Here is another of my Splitcoast Dirty Dozen cards. Each DD month has a theme. If you are a member of the Fan Club, you can view more details about this card and its relation to the challenge here. Selective inking and masking is what makes this card possible! First I inked up all the body except the head and stamped that; then I inked up the head and all the neck and stamped that. 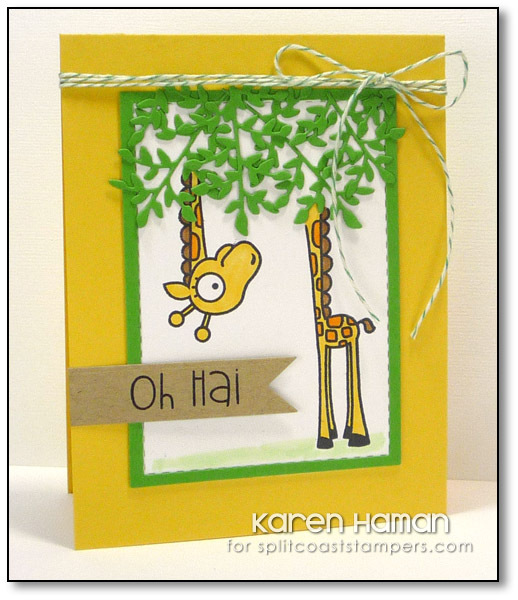 This entry was posted in cards, Paper Smooches by karen h. Bookmark the permalink.